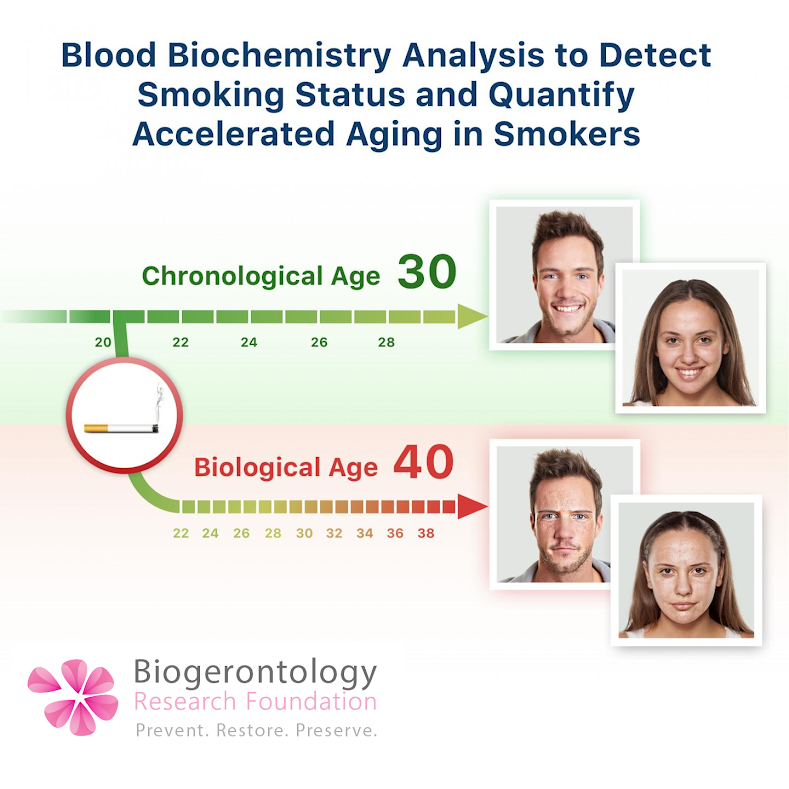 Jan 17, 2019, London, UK The Biogerontology Research Foundation announced the publication of a new open-access research paper entitled "Blood Biochemistry Analysis to Detect Smoking Status and Quantify Accelerated Aging in Smokers" in the journal Scientific Reports. The collaborative study was conducted by researchers at the Biogerontology Research Foundation, Oxford University, Boston University, Canada Cancer and Aging Research Laboratories, the University of Lethbridge, the Center for Healthy Aging at the University of Copenhagen, The Buck Institute for Research on Aging, and Insilico Medicine. The study demonstrated that smoking status, i.e., whether an individual is a smoker or a non-smoker, can be predicted by applying AI-based analysis to standard blood test results alone (specifically, blood biochemistry and cell count results). The study involved constructing deep learning-driven age-prediction algorithms, and applying them to a cohort of smokers and non-smokers in order to quantify the extent by which smoking accelerates biological ageing. Remarkably, female smokers were predicted to be 2x as old as their chronological age compared to non-smokers of the same age, and male smokers were predicted to be 1.5x as old as their non-smoking counterparts. Some of the most important blood biochemistry markers found to impact the predictive accuracy of the study’s smoking classification and age-prediction algorithms include glycated hemoglobin, urea, fasting glucose and ferritin. The research presented in this study could pave the way to complimenting or even replacing more error-prone methods of assessing the prevalence of tobacco use among general populations, like the current de-facto standard of self-reporting among smokers and non-smokers. It is also possible that methods like those used in the study could eventually be applied by insurance companies to detect the smoking status and degree of tobacco use among their insurers as well as by the other institutions that work towards a noble goal of reducing or eliminating smoking. It also provides the anti-tobacco groups a new tool in outreach. People may not care how long they live or how healthy they are but they may care about how quickly they age. It may be worthwhile to quit smoking in order to look and feel younger.